Antique hand illuminated page on thin lambskin. Inherited along with several other manuscripts, some very large. This is about 5x7. The size should be discernible from the ink pen included in the first photograph. Thank you for contacting Mearto with your appraisal inquiry. So that I may best assist you, can you please upload a few better images of the illustration of the praying monk and some details of the surface of the letters. I hope these will suffice. Parts of the manuscript are quite worn. This includes the picture and some of the letters. The side of the vellum sheet looks as though the page was once in a book. On the less worn parts the letters feel pretty smooth but still feel slightly risen. I did find one note that the sheet was bought in France in the 20’s. I hope the photos and additional information helps. If necessary, I can remove the manuscript from the frame and take more photographs. Oh, the gold parts of the picture, letters and decoration are still fairly iridescent. Have I given you enough for an appraisal or do you need unframed photos? Thank you for the additional images and your patience. The presented object is an illuminated manuscript of the 14th or 15th century. 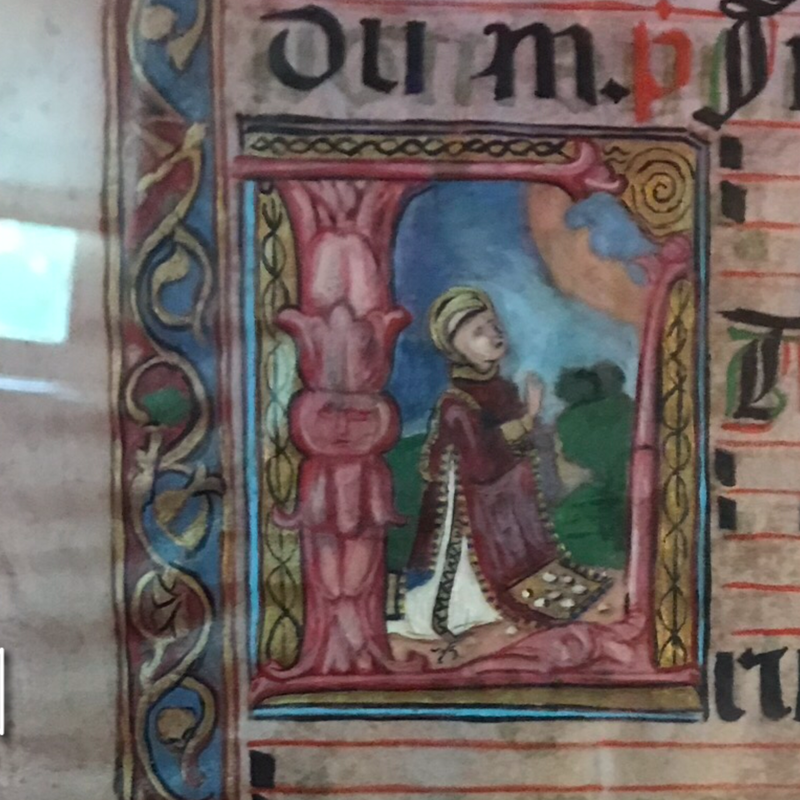 We have here one page of a liturgical manuscript which has an illustrated detail. This detail shows a monk in praying position. Sadly this saint or monk is not to identify because there are no more attributes of other hints to the story behind this image. These "Missale" are used during the mass in cloisters. An estimation would be between 200 to 600 USD.